I always love getting the latest issue of the Smithsonian magazine and this month my reward was a teaser article about the young installation artist, Brian Jungen. More information is available at the Smithsonian website but I will give a nutshell preview here. The Smithsonian is hosting a major exhibition of Jungen's critically acclaimed work at their National Museum of the American Indian, running from October 16 2009 through August 8 of 2010 on the National Mall, Washington DC. Entitled "Brian Jungen: Strange Comfort", this is the first solo exhibit of a living Native American artist in the five-year history of the museum. Featured are the artist's iconic pieces as well as major works never before seen in the United States. 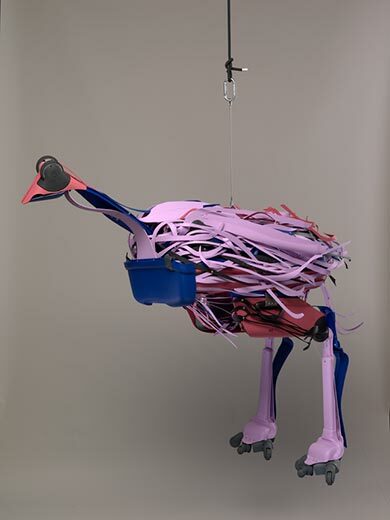 Jungen, half Swiss-Canadian and half First Nation Dunne-za Indian, has turned Pop Art upside down and inside out by creating these stunning aboriginal sculptures out of mundane modern items such as luggage, shoes, broken chairs or even garbage cans. Viewers initially wowed by the craftsmanship, beauty and imagination of the work in general, then get to the really fun part -- recognizing the everyday objects within each piece. People are naturally free to interpret the various combinations of images and objects however they please, but the artist himself has definitely invested his own specific ideas about how aboriginal and Western culture connect in each one of the works on display. So, let's go on a mini-tour. 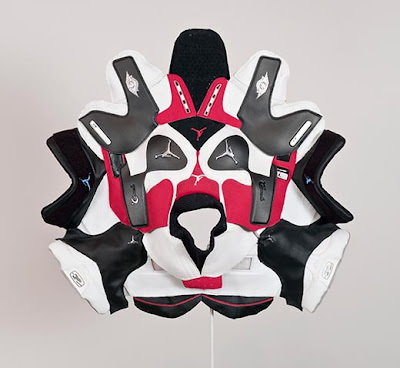 The ceremonial masks pictured above were inspired by the colors of Nike Air Jordans which also are the colors of the Haida, an indigenous people of the Pacific Northwest. 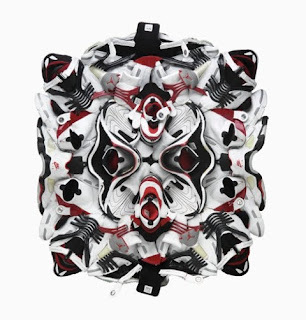 Meticulously fashioned from deconstructed athletic shoes, there are 23 in the series (corresponding to basketball legend Michael Jordan's number). In fact, Jordan owns one of the sculptures. Jungen says he was impressed by how these shoes are revered and displayed in our American culture almost like museum objects. Also, his use of sports equipment gently satirizes the use by professional teams of the names: Indians, Chiefs, Redskins and Braves. This is one of my favorites. It is the centerpiece of the exhibit, installed in the Potomac Atrium, the museum's soaring rotunda. 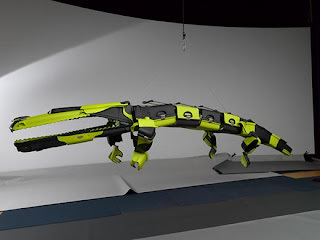 A dramatically suspended mobile, 26 by 20 feet, it includes five animals native to Australia, the shark, possum, sea eagle, emu and crocodile (the latter three pictured above). Jungen actually camped out on Syndey's Cockatoo Island (directly in line with Sydney International Airport), gazed up at a night sky filled with stars and aircraft, and was inspired to create the sculptures in a mobile, reflecting the animals that Australia's aborigines saw in the constellations. And, of course, the materials he chose for this piece were luggage parts. 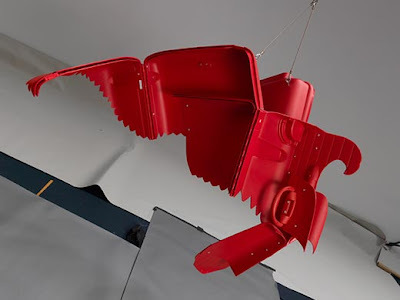 Another of my favorites, one of Jungen's whale sculptures. The artist was reading about the history of whaling at the time he discovered what to him was a huge treasure ... a bunch of broken white molded-plastic patio chairs in a trash heap. 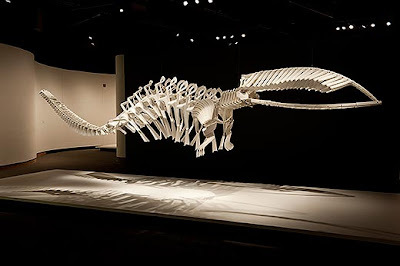 And thus we have The Shapeshifter above, one of three exquisite 21- to 40-foot-long whale skeletons, worthy of display in any natural history museum. 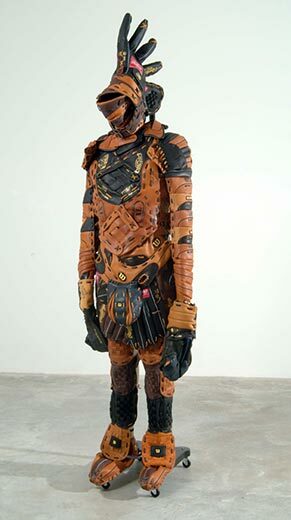 I couldn't find a story for this piece, but it captures the image of a handsome Indian Chieftan in a suit of armor, and it is constructed on a dress form entirely out of baseball gloves. Personally, without over-intellectualizing this artist's philosophy or motives as some try to do, I simply enjoy seeing such entertaining and inventive work. Especially in a collecton like this. People like Brian Jungen are constantly pushing the boundaries of art expression, keeping us on edge and paving the way for the next exciting artists who will, in turn, stimulate us with even newer ideas. We haven't yet morphed into the enormous egg-headed, spindly-limbed geekatoids predicted years ago by science fiction writers as an unavoidable consequence of being glued to a computer screen 24/7. Some of us (you know who you are) may be getting close, however. Facebook is just one of the magnets potentially drawing us deep into a cyberspace life, away from weight-bearing exercise and other human activities like tending to family, work and taking out the garbage. But it IS such a fun and addictive diversion. God! Find your long-lost friends and relatives, feel the rush of someone posting something on your Wall, enjoy watching your list of friends grow. You can jump into all sorts of discussions including serious ones about maintaining your precious privacy .... on a website with some 300 million members! Therapeutic breaks from working at my computer every day have never been so satisfying. Much better than potato chips! 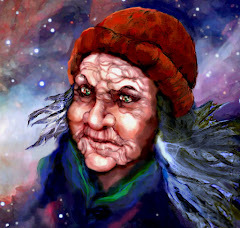 Because of the privacy concerns mentioned above, some of us are being very judicious about giving away the store: Some profiles will show only a partial name, a really old photo (maybe even one of your dog or cat) or in my case a piece of artwork, and no location, no date of birth or any personal likes or dislikes at all. This is a little extreme because we are on Facebook, after all, to make connections, so some barebones info has to ring true in order for our buddies to recognize us and for others to become friends. Other folks just let it all hang out. You might be able to show up at their home for dinner. That could be a bad thing. So, as in all things, moderation is probably the way to go. But simply getting your stuff up on Facebook at all, no matter in what form, just might be a winning move for your psychological well being. Now, The Big Wall .... it is always awash with colorful photos, book covers, artwork, puzzles, games, personality tests and so on, splashing endlessly down and down into Facebook oblivion; a gorgeous and crazyquilt explosion of Electronic Graffiti, refreshed constantly and tirelessly by eager Facebookers. No muss, no fuss, no spraycans. And then there are the writings .... and I do admire the courage and candor of those blurting out Twitteresque statements about what they are doing "right now" for all to ponder. This is yet another form of therapy because it is healthy to have someplace to spill out your immediate thoughts no matter how trivial or even nutty they may be. Just getting them out there at the very least can feel good and may even help organize your day. Certainly, unlike any session with a pro, this will get you a whole bunch of FREE commentary and advice! When did a shrink ever offer a deal like that? But what about the "chickens"? Those who prefer to "watch" so to speak? Well, they can get their jollies by following those Wall Confessions, sort of like Peeping Toms with a perpetual Reality Show. Then there are the grocery list comments like "Don't forget to pick up the pie". This stuff is posted by those very secure in the expectation that their messages will be picked up regularly. Geez, I'm thinking, I hope the pie picker-upper sees this in time. Other proactive types of Facebookers like to pose possibly important questions on The Wall ... philosophical, political or sometimes, as it turns out, merely rhetorical. They have fun engaging in Sophistry with Facebook heads by posing endlessly looping discussions, just because they can! So there is a virtual circus of personalities weaving addictive entertainment for every type of cyberaddict. My advice? Be selective and moderate. I know I am. Anyway, I am very sure that MY time spent on this seductive and amusing website is most assuredly, "Quality Time". C'mon, it's good for me .... it's therapeutic!! What's YOUR excuse? Isn't it maddening how some people can act AND sing AND dance AND write books and music, paint, play killer saxophone and host a TV show all in one lifetime? Others build fantastic buildings, take amazing photographs, cook gourmet meals, compose music, play piano concertos, create Broadway musicals or plays, invent or make earthshaking discoveries, cure diseases .... sometimes in all sorts of crazy combinations. 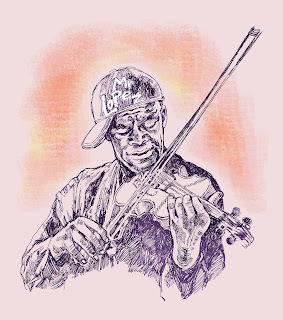 Not many humans can successfully pull off truly high degrees of multi-level creativity, but every person IS endowed with this creative bone that can twang around in all directions. Many do not heed the call, but many others listen to the twang and let it vibrate through them, some latching on to one or another of the internal thrummings, and others spreading their wings to encompass a whole lot more. How someone translates one or more of these into successful expression seems to involve genetic makeup and family influence along with ambition plus a certain amount of good fortune. And as for the super multi-expressive? Just pure genius that we who are not of that ilk can only gawk at in wonder. It is interesting to examine the roots of your own special interests. My twangs had me walking around with a sketch book in hand all the time as a kid. So I always thought of myself as an "artist". Once in 2nd grade, one of my drawings produced for me a prize box of pastels from the principal who had been substitute teaching our class. There was a nice little hint. My dad was a successful architect who also loved gardening and remodeling our home, plus when he wasn't out on the golf course, he could be found making wonderful things in his workshop like salad bowls and mosaic tables. He and my mother were always putting up jars of veggies and a wicked mustard-pickle concoction called "Chow Chow" with produce from his huge garden and lining the shelves of the pantry with them. We were well stocked! He came over to this country from Herning, Denmark as a baby with his mother, father and seven brothers and sisters. Of all of them, he was the most energetic, ambitious and prosperous. My mother was truly a culinary artist, spending many hours slaving in the kitchen, the uphot of such efforts often making her a bit crabby. (OK, even a lot crabby.) She, and we, suffered for her art. And not being much of a feeder when young, I didn't much like some of her more non-kid type concoctions like Prune Whip and Chicken Livers (yuk, still). But I was a perverse, skinny child who will never forget her Pecan Dreams and Rum Pie. (I fed a lot of oatmeal and softboiled eggs to our cocker spaniel, Topsy, under the kitchen table when no one was looking.) Nice. Mother later became a devoted follower of Julia Childs' "Mastering the Art of French Cooking" and with more maturity I finally became a fan. Then there were the "hats". (Dreadful things to me at the time, again an unworthy critic.) But she would often get up in the middle of the night with some mad inspiration for a headdress spiked with pheasant feathers snagged from one of my father's hunting trips. Her Mad Hatter phase lasted long enough to fill a few closet shelves and cover a few reluctant church-going heads. My older sister was also a sketchbook artist along with me and we recorded our impressions of mostly animals and people all the time. Don't remember who inspired us to stick with this so loyally, but it defined our thrummings to a tee. We would sketch characters (especially the odder ones) who populated the train station in downtown Chicago where we would go as a family and wait to pick up my father every Friday night when he was commuting from Flint, Michigan on a special job. My sister once grabbed the attention of a young serviceman while sketching a rather portly woman, but I don't think he was really interested in the sketch. It took me years to figure this out. She went off to study at the Art Institute of Chicago and I was in awe of her life drawings, still life paintings and especially her advertising design piece for Johnny Mercer. I had someone to look up to and emulate. I also had a big brother who made things with his hands (created some fabulous workshop puppets for me one Christmas), invented many unique things out of parts from objects he had disassembled and was always working on his to-die-for Lionel Train set built up on a retractable platform that easily filled half of his bedroom. I was once allowed to act as Engineer, running the train as it wound its way through tunnels in the miniature tree-lined mountains and stopped at all the tiny stations, whoo-whooing all the way. He went off to Parris Island and served in the Marines and then came home to study architecture and join my dad's firm. So I was influenced by my family to latch onto some thrummings. I did the sketchbook thing (still do it), and then began following various internal twangs for awhile. Studied life drawing, watercolor and sculpture before going on to take advertising design courses at the Rhode Island School of Design. Over the years with family and other obligations taking precedent, I have pursued my art intermittently but relentlessly, and now fulltime. Related interests include photography, writing, gardening and cooking. The rich background I came from did have its notable levels of creativity. A funny thing happened then, with one thing inspiring and informing another and so on, thrumming and twanging along on its merry way. Since you are a right-brained creature, it is a very good exercise to engage the left in some synapse-bending quagmires it has never before attempted to tangle with. It raises your endurance threshold. After wrapping your head around a variety pack of blogging websites that promise you can "just click here and start writing", you will ultimately find the one that will actually help you get the sucker done. It inevitably will become clear as a bell how to smash your Title Artwork up into that Title Box so that it fits after you re-size and upload it a bazillion times. Repetition helps it all sink in. It makes you realize that being a picky and meticulous wretch is a GOOD thing. When you finally accomplish getting the seemingly recalcitrant framework in place, correct colors chosen, sidebars all populated, you can celebrate with a glass or two of champagne. Very nice. It gives you something to vent about. And you are here to write, after all, to spread some word about what the hell you are thinking and of course about what you are doing. The inelegant hassle of setting up your Blog will fire up the furnace for your initial blast onto the Blogosphere ..... and then some. It launches you into the brave new world of cyber-journalists who are splashing words about virtually everything, virtually everywhere. Who knew so many people could write?? Or even would write? AND be instantly published as well? Teeming with thoughts and ideas, the Blogosphere is like a massive, undulating electronic diary. One in which you will explore just who you are --- very publicly. A bit daunting when you think of it this way. But who cares .......... jump in! Post that bouncing new baby Blog. It might even be good for business! Exposure increases awareness of you and your artwork! TA DA! So you need to add your two cents to the mix. Someone is bound to read your Blog and look at the pictures. Gotta happen. And then, I have read that good things will follow if you are attentive, persistent and make friends with your fellow Bloggers. So this last reason could be the most important one of the bunch. The other five will improve you as a person, while this one could buy you dinner. Much appreciation to Blogspot for being the Very Best of the Bunch.